BOULDER, CO--(Marketwired - Nov 18, 2014) - Victors & Spoils (V&S) today announced it has been named one of the 40 Best Places to Work in Advertising & Media in the United States by Ad Age, the leading global source of news, analysis and inspiration for the marketing and media community. Of 40 companies selected, V&S came in at number 17. "We've found that people do amazing things when they're empowered," said Jon Balck, President of Victors & Spoils. "Whether they're creating a startup business from scratch, seeding a cultural movement or making world-class communications, our people love experimentation and curiosity." Ad Age recognized V&S's open philosophy, which embraces and promotes collaboration between in-house talent and outside experts. 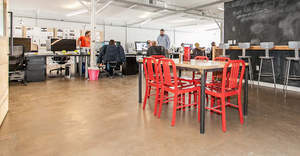 Employees work elbow-to-elbow at long tables inside the agency's street-level office space, fostering a fluid work system. V&S most recently launched Pearl Street Creative Marketplace, which connects marketers who want creative solutions with creative people who want to work. Aside from collaboration, V&S offers a range of workplace perks from block parties for the Boulder community to in-house corn hole tournaments and access to a ski resort rental property. Some of the company's best brainstorming happens at the top of mountains. "With hundreds of companies applying and going through the rigorous employer and employee survey process for the 2014 Ad Age Best Places to Work list, the competition was tough. The organizations that rose to the top are incredibly deserving," said Natalie Zmuda, deputy managing editor at Advertising Age. "In today's dynamic business environment, talent is a key differentiator. The leadership teams we've honored have perfected the art of recruiting, developing and retaining talent, setting their firms apart from others in the advertising and media world. And they've carefully, thoughtfully crafted a culture and a work environment that anyone would be lucky to be a part of." Submissions were evaluated by Advertising Age research partner Buck Consultants LLC. Buck crafted two surveys to help Advertising Age find the companies with the best benefits and most-engaged employees. The employer survey contained about 100 questions, including questions about pay, promotions, health care and other benefits and hiring practices. The employee survey contained about 50 questions. It measured aspects of the workplace environment that contribute to an engaged staff, including matters such as fairness of pay, vacation time, relationships with management and co-workers, career development and other workplace issues. Any agency, ad tech or media company with more than 40 full-time employees in the U.S. was eligible. Victors & Spoils (V&S) is a full-service advertising agency in Boulder, Colo. V&S embraces an open innovation process to access the most creative ideas and strategies for clients. As pioneers in crowd sourcing, today the agency builds uniquely-qualified teams of people, enabling collaboration between in-house talent and outside experts. V&S works with brands including American Express, Coca-Cola, Driscoll's, General Mills, Harley-Davidson, JCPenney, Adidas, LivingSocial and Unilever. To learn more, visit www.victorsandspoils.com. Advertising Age is recognized as the leading global source of news, analysis and intelligence for the marketing and media community. Advertising Age includes ongoing coverage of strategic topics for marketers from mid to large companies complemented by breaking news and a database of the world's best creative. The 84-year-old publisher produces more than 15 original rankings each year, including the 100 Leading National Advertisers and 100 Leading Media Companies lists, the Digital A-List, and the annual Agency Report. Victors & Spoils, headquartered in Boulder, Colo., was named one of Ad Age's 40 Best Places to Work in Media and Advertising. The office space fosters creativity and collaboration.